On Monday we syndicated an outlook for crude oil that was at least a little bit alarming. Specifically, Oil Price Information Service's co-founder Tom Kloza cautioned that seasonal influences could crimp demand for oil. This is around the time of year when refineries are maintained; some of them are also still switching over to heating oil production. End result? A backup in the supply of unrefined crude that ultimately puts downward pressure on prices. Another round of hurricanes that shutter refiners will only exacerbate the problem, that at least sometimes those shutdowns are matched by production shutdowns as well. The $64,000 question is, is there any empirical evidence that there's a seasonal slowdown that puts the kibosh on crude prices? Or, is this just another one of those half-baked assumptions that sounds intelligent on paper but ignores the dozens of other factors that could apply bullish pressure on crude prices? The answer may surprise you. The answer is yes, crude oil really is moving into a time of year when bearish price pressure is reliable. There is a caveat though. The graphic below tells the tale. On it are four main plots... the average day-to-day outcome of a bullish year for crude oil prices, plotted in blue, where the red plot indicates the average day-to-day net change in the price of oil in a losing year for the commodity. The black line is the average performance for bullish and bearish years. The blue line? That's where crude oil prices are year-to-date... a bit ahead of the norm. The thin green/blue lines in the background are the actual path crude oil prices followed for each and every year going back to 1984. Clearly that data isn't useful on its own for trend-spotting purposes, though it is worth noting that crude prices exhibit huge standard deviations. That is to say, the actual results in any given year can vary widely from the norm. Interestingly, this year is odd in that it's been relatively typical. That's not the big take-away though. The most important aspect of this chart is that Kloza wasn't talking about a mere theory. From early October to early December is a tough time for oil prices. Even in a "good" year, late-October to mid-December dishes out modest losses (albeit it before a nice year-end rally). It's certainly not a guarantee for 2018. If hurricane season somehow doesn't hit as hard as it usually does - as unlikely as that seems right now - we're making comparisons to recently-rough years. It's also worth noting that current crude oil stockpiles are at multi-year lows. A temporary closure of many refineries may not lead to the inventory backup we would have seen last year and the year before. Even so, all things are relative. 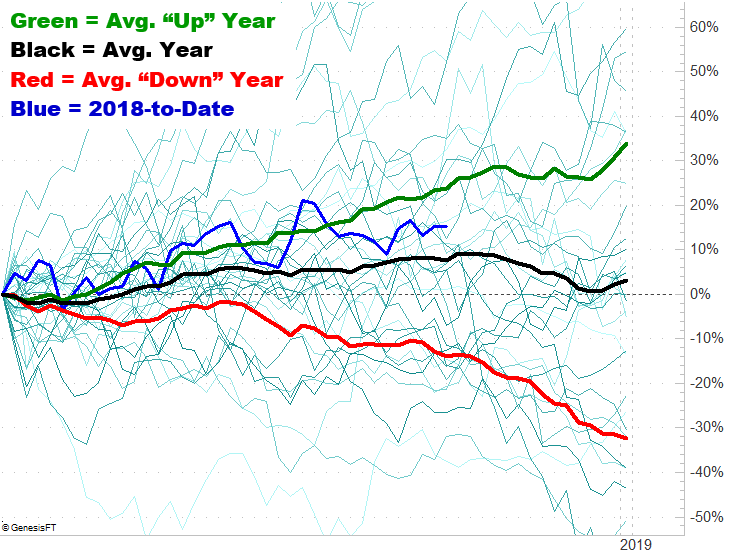 The averages are a look back at a few decades' worth of data, and the lull around this time of year has been oddly reliable. 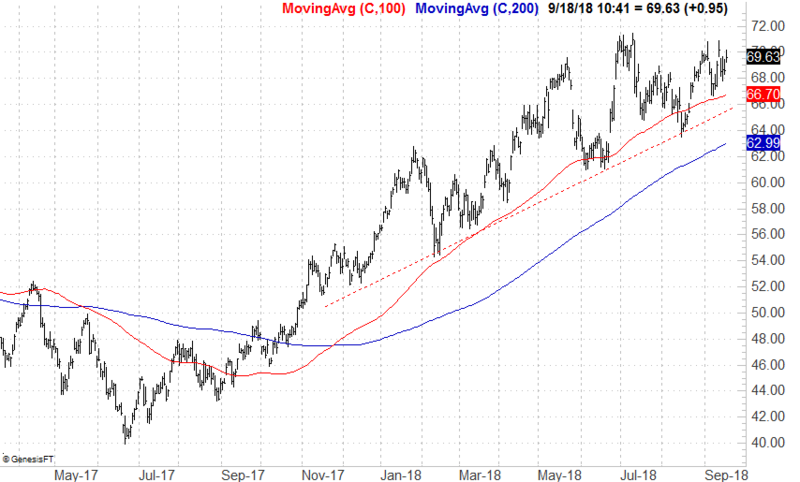 A bet-ready trade? No, not just yet. 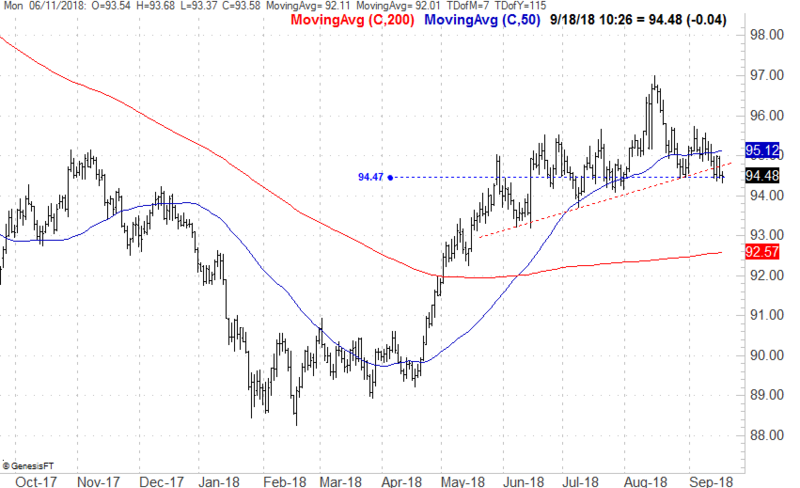 Crude oil prices are still holding above a couple of different support lines that could bring a quick end to any weakness. If either or both of those support levels fail to hold back the sellers though, sheer momentum could do a lot of the bearish work that often gets done this time of year. The U.S. dollar is also testing the waters of making lower lows, putting upward pressure on oil prices. Still, a tendency is a tendency for a reason. Traders should at least acknowledge history has turned into a tendency for a reason. As always, rule out nothing, and prepare for anything.